One of the most challenging aspects of decorating a room is choosing the wall color. If you're starting from scratch, the wall color should be one of the last things you decide on. Let the room's furnishings, accents and decorative accessories help guide you to the right hue. Naturally, there are lots of other considerations when it comes to choosing wall colors. Wall colors have a profound effect on the atmosphere of the room, making the type of room you are painting an important factor in color choice. Also keep in mind wall colors are not limited to just paint. Wallpaper, tile and paneling also come into play when adding color to walls. 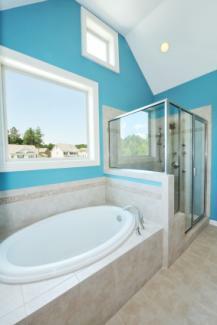 A small room like a bathroom can pack a lot of punch depending on the paint colors you choose for the walls. Rosy shades of pink and light orange hues such as apricot or peach flatter skin tones. Neutral colors and muted greens and blues create a soothing atmosphere perfect for the trending spa-like bathroom. Sharply contrasting colors like black and yellow or black and white can bring a sophisticated, modern feel to the bathroom. 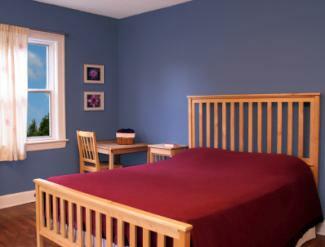 Feel free to inject some of your own personality when choosing the best colors to paint a bedroom. Surround yourself with a color you truly love and also works well with your bedding and decorative accents. The most popular bedroom colors impart a tranquil, restive atmosphere. Muted colors lend a more sophisticated look to adult bedrooms while bold, bright colors and pastels are common in kids' rooms. Bring attention to the bedroom's focal point or add drama with a standout accent wall. The color of your kitchen walls brings warmth and personality to the room. 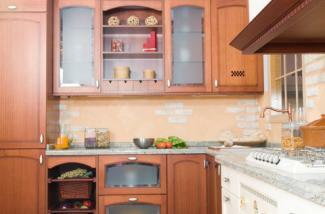 The best kitchen colors also enhance the style of the room. Mediterranean kitchens often feature walls with warm, earth tone colors and faux textures for an aged look. Country kitchens tend to be light and bright, with classic white walls, cheerful shades of yellow or soft blues and greens. Neutral walls in modern kitchens leave room for bold colors on cabinets and striking color contrasts on wall tiles. The architectural features and lighting in your living room are important factors in choosing the best color for walls. Cool whites with blue undertones can make the room feel cold if it has a northern exposure or limited natural light. Warm colors appear to advance and can give a large room a cozier, more intimate feel. Cool colors in lighter tints can make a small living room feel more spacious. 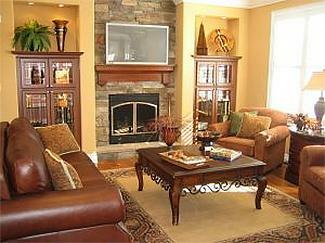 Family rooms should feel warm and welcoming and neutral colors on walls do just that. Neutral wall colors also work well in rooms that get redecorated often, allowing you to change your décor without needing to repaint the walls, whether it's family room, living room or bedroom. 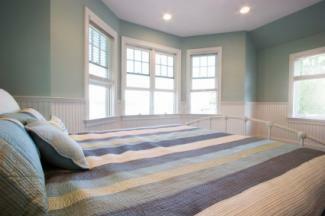 A safe way of adding color to the walls in a room without an overwhelming or jarring effect is to use muted colors. Muted colors read as neutral colors when used on walls. If you're having trouble committing to just one color on the walls in a room, add interest by combining paint colors on walls. 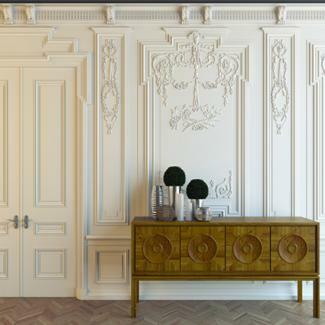 Paint an accent wall to enhance an architectural feature. Create stark contrast using complementary colors on wall stripes or stenciled designs. When using bright colors on the walls, go light and neutral on trim and mix in some neutral accents to give the eyes a rest. Unify an open concept room with analogous colors that play well together as they sit next to each other on the color wheel. Monochromatic colors consist of varying shades and tints of the same hue and work well when layering colors with specialty faux painting techniques. Grab a color wheel from your local arts and crafts store to come up with more coordinating color schemes for walls. You can also look to fabric patterns for ideas on colors that work well together. When you're tired of seeing a color on the walls that you didn't choose or perhaps you tried a color that has lost its appeal, it's time to update the room. Take a look at some of the most popular interior paint colors that are seen time and again in decorating magazines and interior design websites. Instead of passing fads, look to classic colors that have timeless appeal and color trends with staying power. White is one of those colors, with endless nuances and it goes with everything, as long as it has an undertone that works with the other dominant colors in the room. Your home's architectural style may narrow down your wall color choices if you want to stick with look that's authentic. 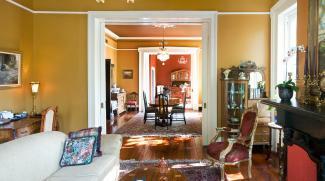 Interior and exterior walls on historical homes should reflect the colors used during those eras. Wall color also helps enhance rooms decorated in a specific style or theme. Victorian colors - Muted earth tones brought drama to interiors while bright, contrasting hues made an impact on exterior walls and trim. French Country colors - This popular color pallet is inspired by French lavender and poppy fields under the sunny blue skies of the Mediterranean countryside. Mission style colors - Inspired by nature and building with natural elements, earth tone wall colors are a signature look of Mission Style interiors. French Empire style colors - Starting with the softer tones of French Country colors such as lavender, lemon, light green, blue and brown, late French Empire colors intensified to rich reds, golds and greens. Colonial colors for historic homes - The common use of natural pigments from plants, soil, and minerals resulted in hues of white, creamy yellow, almond, dark and reddish brown, beige, taupe, and muted green. If you don't find a color you like in a historical or themed pallet, move on to other choices. Don't waste your time and money settling for a color you know you can't live with. For those who follow the principles of Feng Shui, color, in conjunction with direction, can help influence the Chi energy in the room. Find out how colors and direction work together in rooms. Then explore the best Feng Shui colors for bedrooms or Feng Shui colors to energize a workout room. Don't forget exterior Feng Shui colors for the walls outside your home. Bring paint sample pots home of your top three to five wall color choices. Roll the colors on sample boards to view them under the changing light conditions in the room. Light and the surrounding decor colors will always affect the color you put on walls.